What would the December holidays be without great food and beautiful bubbly? 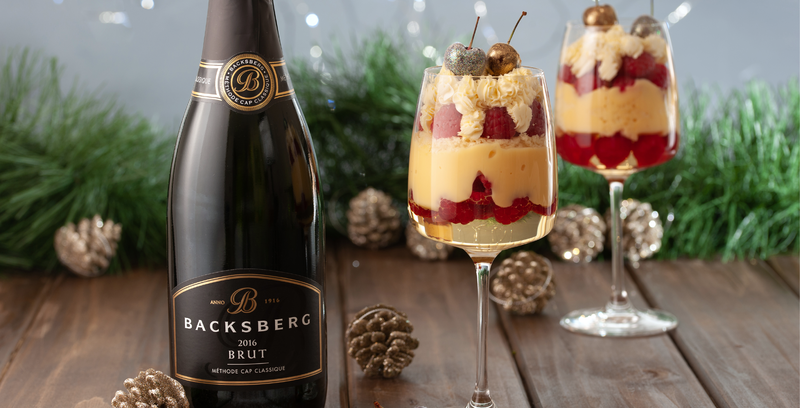 To celebrate the end of the year, we’ve teamed up with food stylist and recipe developer, Nita West to bring you a fabulous Christmas Trifle recipe, which pairs triumphantly with Backberg’s crisp and delicious Sparkling Brut MCC. Not only is this superb recipe yours to enjoy over the holidays, but we’ll be giving away a case of our Sparkling Brut MCC to one lucky follower! To enter, all you need to do is recreate this recipe at home, take a picture and post it to Instagram, tagging @backsberg and using the hashtag – #GetFestiveWithBacksberg. Make sure to follow @backsberg, @nita.west and @ilovefoodiesct to partake. Judging will be left in the very capable hands of the team at I Love Foodies, who will announce the winner on 19 December. Good luck! We’re excited to see all your interpretations of Nita’s Christmas Trifle and can’t wait give away a box of bubbly to our winner! Download or view the full recipe here.